After a few years of playing music as members of other bands, brothers Stephen and John Gomez, along with longtime friend and fellow musician Jessica Bowen, set out in the spring of 2007 with a new idea in mind, and, with new found lead singer Brian Dales on board, they formed The Summer Set. The Summer Set began with a simple goal: to bring its unique and catchy brand of fun, upbeat pop rock to as many fans as possible. 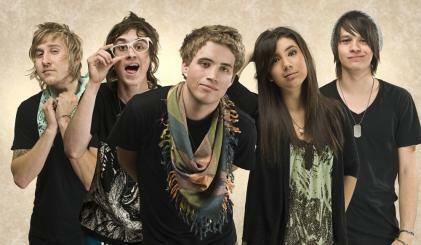 Soon after the pieces fell into place, The Summer Set began planning and writing their first EP, “Love the Love You Have,” which was self-released in November of 2007. The band independently sold 7,000+ copies in just a few short months. With their catchy melodies and cool, approachable, ‘friends next door’ image, the band quickly captured the hearts of local fans in their hometown of Phoenix and assembled a strong and loyal fan base across the west from weekend tours. They set their sights on doing the same throughout the rest of the country. After shopping around to find the perfect label for the band, The Summer Set recently signed a record deal with ‘The Militia Group’. They are extremely satisfied with their decision and new family. Shortly after that decision was made, the band set out to record their newest EP entitled ‘In Color’. With the recording done, the band lead singer Brian Dales, bassist Stephen Gomez, guitarist John Gomez and drummer Jess Bowen, are all eager to hit the road, play shows and build their fan base across the country. ‘In Color’ will be available on iTunes June 24th and in stores later this summer.